Are you ready for June 1???? 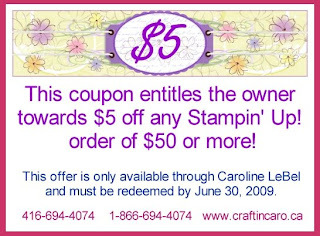 It's going to be a CRAZY exciting day for all Stampin' Up! demonstrators! 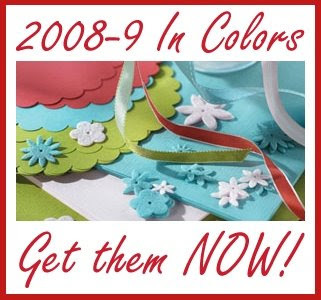 We get to see and then pre-order the new 2009/10 In Colors, Level 2 & 3 Hostess sets, new sneak-peek stamp sets & accessories from the upcoming catty AND get our free new catty included in our order so we'll have it in our hot little hands in DAYS! Oh yes, and the retiring stamp sets & accessories list come out tomorrow as well. HOW CAN WE STAND THE EXCITEMENT?!?!?! Okay, that might have been the run-on sentence of the year, but can you tell how psyched we all are? It's a great time to be a demonstrator, that's for sure. And if you are reading this on Sunday, you can still have today to buy your $99 Starter Kit and get in on all the fun on Monday! Regardless of whether you want to join the team or not, you DEFINITELY want to be back here on June 1 to see the lists and find out what's new and exciting for June, so tune in again. OH YES! I'd be a bad demo if I didn't remind you that you can still take advantage of the "BUY 3, GET 1 FREE" Papers promotion -- but today is the last day. If you want to stock up on all those yummy Designer & Textured papers, now is the time. 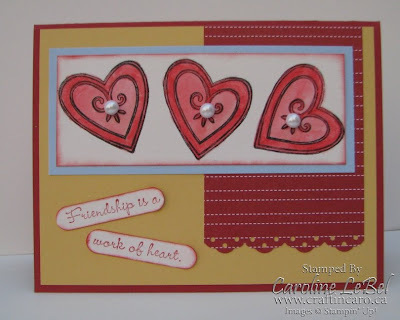 If you're not too sure how to use Designer papers in your cardmaking, be sure to visit Splitcoaststampers and do a search for "DSP" ... you'll find over 6000 great projects to inspire you! Say "Bye-Bye" to the 2008/9 In Colors! It's that time of year as we prepare to say "Adieu" to our current crop of In Colors as they ride off in the sunset. "Adios" to Baja Breeze, Riding Hood Red, Kiwi Kiss, Pacific Point, Tangerine Tango and Pink Pirouette. We'll miss you! NONE of Stampin' Up! 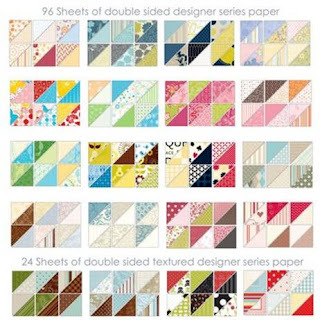 's products that include these colours will be available in the next catalogue, so all of those fabulous ribbons, Simply Scrappin' kits & Designer Series papers will be selling out fast. I don't want you to lose out on them, so be sure to order them right away to avoid disappointment. So be sure to pick up your ink pads, re-inkers, cardstock (both 8.5x11 and 12x12 & textured), ribbons and Designer Pattern Papers. Before I go, let me welcome FOUR more stampers to the "Canadians, INK!" family today: Tricia, Karen, Josephine & she-who-wants-to-stay-anonymous - LOL! Last day for the LAST CHANCE CONTEST!! Wouldn't you like one JUST like it? It's super easy! Today is the last day for my Retiring Sets Contest, and you just need to email me your top 10 choices of sets YOU think will be retiring. Also, don't forget that SUNDAY is the final day for the awesome $99 Starter Kit that SU is currently offering. If you are looking to save 20-40% off your purchases or to start your own business, you won't find a better deal than this one. See here to learn more. 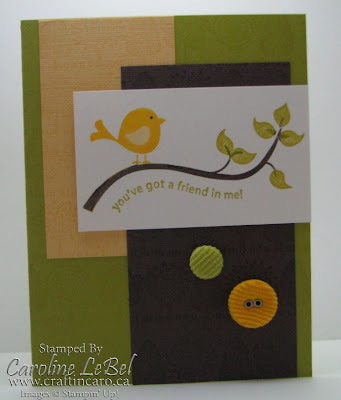 Here are the last 2 class cards we are making, using Good Friend, Cheep Talk, the Funky Forest wheel as well as "Good Morning Sunshine" Designer Paper. 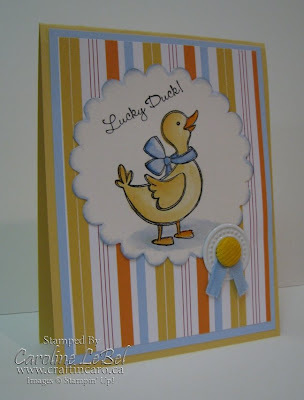 Please take a look at yesterday's post to see the other 3 cards. Hope to see you at the class! 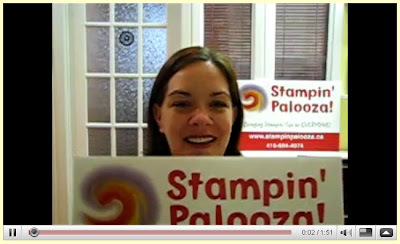 Want to learn more about Stampin' Palooza? ...then be sure to check out my video message! Love those Funky Birds and Flowers...class! 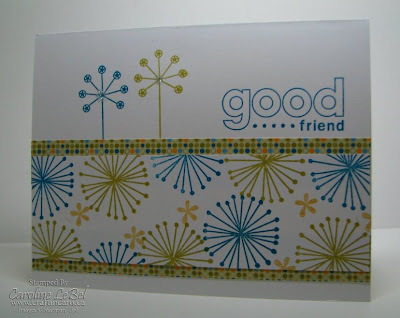 Here are some of the Thursday class projects we are making, using Good Friend, Cheep Talk, the Funky Forest wheel as well as "Good Morning Sunshine" Designer Paper. We have to make good use of all those gorgeous Kiwi Kiss and Pacific Point papers before they retire next month, after all! 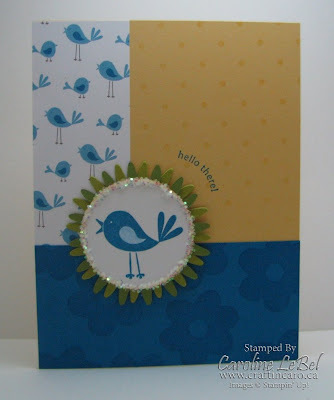 Wonderful tags with wonderful little birds! 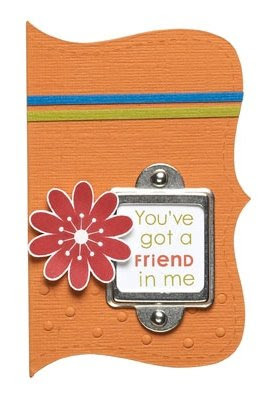 Make a loved one’s day with this very adorable, sunny tag tied to a gift (candy, anyone?). 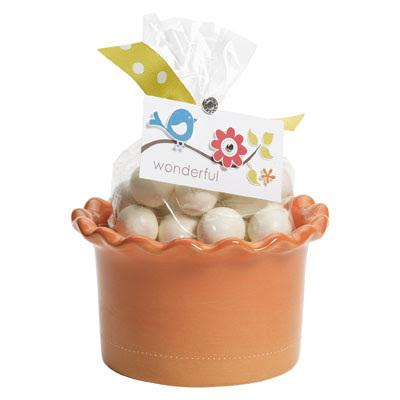 With bright, cheerful birds, flowers, and leaves — and polka dots to top it off — you’ll should have no problem leaving a lasting impression. 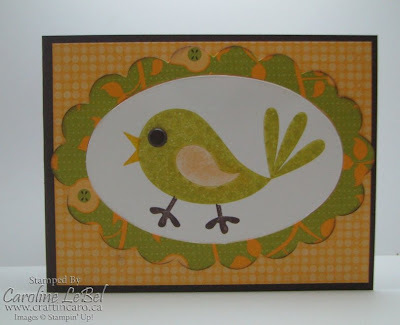 If you like these cute little birds, you should consider coming to my Thursday class -- we'll be making projects using Good Friend, Cheep Talk as well as the Funky Forest wheel! 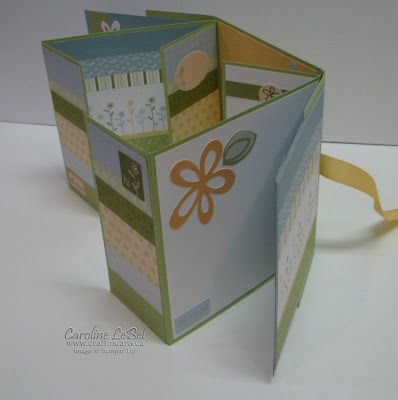 New Video Tutorial -- Flip-Flop Album! With all the recent interest in my Flip-Flop albums class and kits, I've created a really quick video tutorial to help you re-construct the spine and flaps of the album using your own kits. 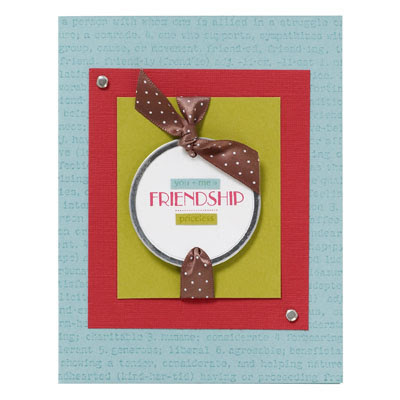 Before I start showing you the stamping goodies of the day, I just want to holler a happy "shout-out" to Nancy in London who just joined the team today -- woohooo! 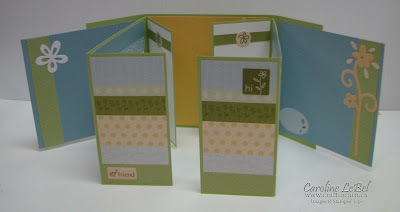 Here are the final three cards we'll be making as part of Tuesday's "Wagon Full of Fun" card class. If you missed the first two cards we'll be doing, you can see them in this previous post. There are still spots available for both the 1pm and 7pm classes, so please drop me a line if you would like to attend! Alternately, if you would like to pick up all the supplies & instructions on how to make this set of 5 cards yourself, you are welcome to order them below! 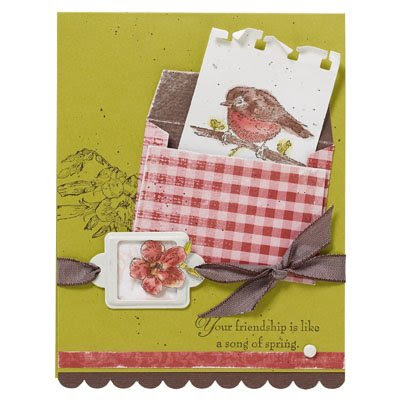 Send unexpected wishes and appreciation to friends and family with this watercoloured Spring Bird card. With a one-of-a-kind design, you can let them know how much you care and show off your artistic talents and love of colour! 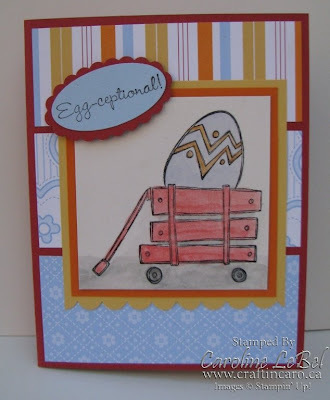 Here are 2 of the cards we are making on Tuesday for the "Wagon full of Fun" watercolor class. 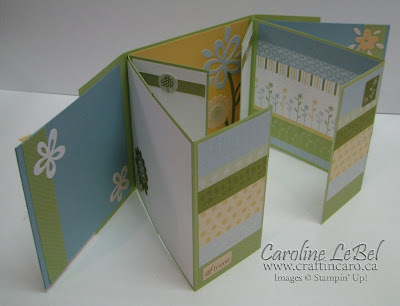 I had great fun creating the 5 cards -- all of which use the Washington Apple Designer paper. I'll be sure to post the other three on Monday! 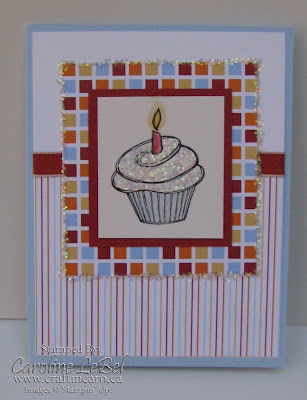 Can't get enough of Stampin' Up! videos? 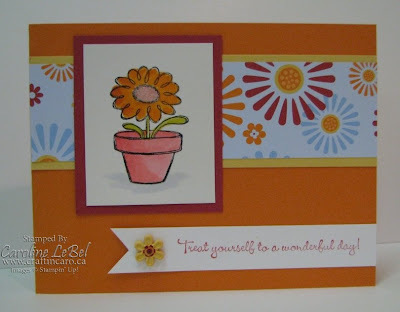 Check out their fabulous You Tube channel, where they share great stamping projects (and more!)! The best thing to do is to subscribe to the channel. There is no cost to subscribe (you just create a user name and password), and then, whenever they add another video you will be notified! While you're at it, be sure to subscribe to my YouTube channel as well: craftincaro. Now that Brent and I have started to get the swing of recording things, there will be many more projects to come. 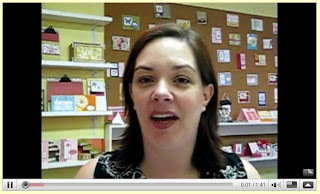 I've even recorded a message about my Retiring Stamp set contest, so be sure to check it out! 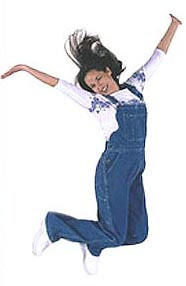 Jump for Joy -- new catalogues have been ordered! I've placed a massive catalogue pre-order for Stampin' Up! 's new 2009/10 Idea Book & Catalogue so that they'll arrive before the July 1 launch date. Want to reserve your very own free catalogue? I'm your gal! Just contact me now by e-mail or phone at 416-694-4074 (toll-free 1-866-694-4074) and we'll get you on the pre-order list. The catalogues will be available for pick-up at my studio in July or I can mail it to you if you prefer that (small postage charge will apply). Please note, this offer is only available to Canadians. No fellow demonstrators, please & thanks! Did you know that it's that time of year again? 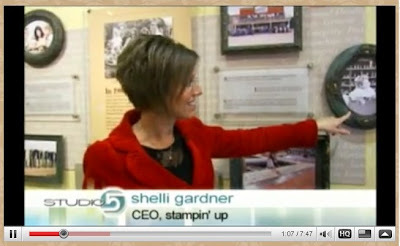 Yup, Stampin' Up! is getting ready to release their "Last Chance" Retiring List on June 1st, letting us know which stamp sets will no longer be available for sale as of July 1. Which brings us to the CONTEST!!!! 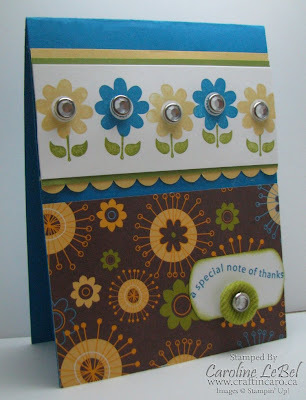 This year, please email me your top 10 guesses of stamp sets from the current Spring/Summer 2009 catalogue that will retire (not including hostess sets) and get a chance to win "God's Beauty", a Level 1 Hostess set. The winner of this contest will be the entrant with the highest number of correct guesses -- if there is a tie, then I will draw a name from those participants who have guessed the most. As an added bonus: if the winner gets all 10 out of 10 correct, I'll throw in a 2nd HOSTESS SET! How's that for sweetening the pot?!? BUT I WANT *EVERYONE* TO WIN SOMETHING! Be sure to check back here on Monday June 1 to see the Retiring List in its entirety and the winner of the contest. The Fine Print: Please note, this offer is only available to Canadians. No fellow demonstrators, please & thanks! All entries must be received NO LATER THAN Friday May 29th to qualify. 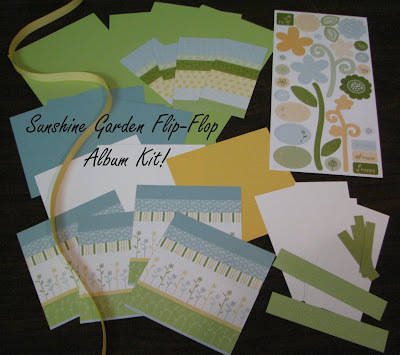 Flip-Flop Album -- take the class or get the kit to go! The weather's warming up here in Toronto today so it's time for FLIP FLOPS! 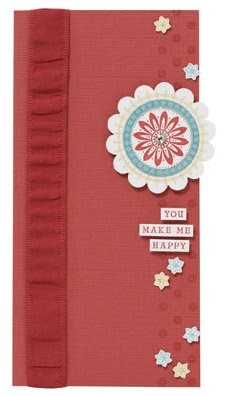 No, I'm not talking about the thong sandals, but about these fun little 6x6 flip-flop albums instead. 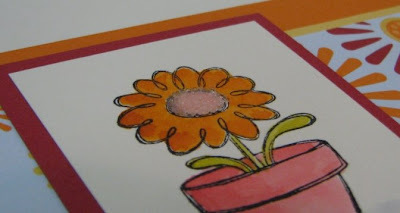 We’ll be making them on Friday and Saturday using elements from the “Sunshine Garden” Scrapbooking kit (p. 164). Cost for the class is $19.95 per person or you can request a kit "to-go" with all the pieces you need, full instructions and photos. I'll be launching my RETIRING SETS guessing contest tomorrow, so make sure you come back to see all the details. Everyone who participates will also get a special gift from me, so it's definitely one of my "win-win" scenarios.